Over the last year or so there has been a new approach at H&F Council’s Cabinet Meetings. The Opposition have been forbidden by Cllr. Stephen Greenhalgh (Con) the Leader of the Council to ask questions and, at times, even speak. The meetings can sometimes be over in just five minutes. Usually, Cllr. Greenhalgh shouts out a series of numbers relating to agenda items and his colleagues obediently respond with the words “Agreed!” The real discussions have always taken place days before at a secret call-over meeting. On the occasions that my Opposition colleagues and I have been able to garner some form of response it’s hardly been what one might expect from a government institution in the world’s oldest democracy. Consider the Cabinet Meetings on the 18th July 2011. Cllr. Greenhalgh refused to allow any of the Opposition to ask questions or even speak at the packed public meeting - I spoke anyway. Or take the one on 20th June 2011: My fellow Opposition Councillors wanted to ask about the tri-borough deal with K&C and Westminster councils. Cllr. Greenhalgh asked why we had “bothered to turn up”, forbade any questions or comments from my colleagues and said I could make a short statement. He then announced that if we wanted questions answered we should write to him or his officials (which we had done anyway). The meeting on 9th May 2011 was similar. We did get to ask questions at the Cabinet Meeting on 18th April 2011. But when Cllr. 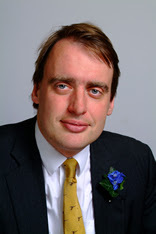 Greg Smith (Con), H&F's Cabinet Member for Residents' Services, was asked about proposals to sell off homes on a Fulham estate because of his Administration’s self-confessed “failure to cut crime,” he responded with the words “You tw*t!” and followed that up with a tirade of other foul-mouthed abuse. The public have been met with similar condescension even when they turn up in their hundreds as they did over the sell off of our local ‘Big Society’ voluntary clubs or the demolition of Shepherds Bush market. The Fulham and Hammersmith Chronicle was even suckered into running Cllr. Phibbs’ spin on page two of their current edition. This being an apparent break in the Chronicle's boycott, of sorts. Back on the 14th June 2011 one of their employees had told me they’d decided not to report anything about the activities of Labour Opposition Councillors - a strange decision for a self-proclaimed "proper paper." Cllr. Phibbs and his colleagues can’t have it both ways. He knows full well that the Conservative Administration have corrupted the democratic processes. That’s not just at Cabinet Meetings - were the Opposition do not have speaking or voting rights but at Full Council, Select Committee and Planning Applications Committee meetings where we do. The Borough’s Full Council Meetings are manipulated to stop the Opposition even talking about subjects that may upset the ruling Conservative Administration - such as closing down homeless charities or debating the Administration’s approach to crime reduction. The Conservatives actually cut back the number of the Borough’s Select Committees because they couldn’t get Conservative Councillors to attend or ask questions. Even then these meetings are very weak with, for example, this year the Conservatives actually voting to go to the pub rather than ask about the Council’s controversial budget. The Planning Application Committee meetings, which are supposedly quasi-judicial, has long been thoroughly discredited. There are 15 Labour Councillors and 31 Conservative Councillors. We cannot out vote them. Despite this we have still forced H&F’s Conservative Administration to reverse police cuts to the ward with the highest crime, reverse the 18% salary rise the Conservatives awarded themselves, reverse the secret 14% salary rise the Leader of the Council awarded himself and much more. Ultimately the public are the boss. So my fellow Opposition councillors and I make it a priority to let them know what’s happening. We do this via the regional and national media, and given the Chronicle’s boycott, we rely on respected local websites too. We work closely with residents, local groups and associations and have uncovered numerous questionable activities the Council secretly tries to get away. You just had to look at the expression on Cllr. Phibbs' face at Tuesday night's packed public meeting when I questioned him about his Administration's secret dealings with the property speculator responsible for the hideous proposals for Hammersmith Embankment - which he refused to answer. It was easy to see how he knows full well that this Labour Opposition holds him and his colleagues fully to account on all they get up to. In fact one leading Tory councillor once complained to me that I and my colleagues had made Hammersmith and Fulham "the most infamous council in the UK." I pointed out that he’d done that, I’d just ensured his activities were reported. If Labour wins the next local elections in 2014 there will be a new, more democratic approach. We'll repair the Borough's democratic processes and we will work with all, irrespective of their party political preferences, to deliver on the promises we make prior to the elections in a publicly circulated manifesto. If any of those I know have anything to do with it, this fascist Con led council will be OUT OF THERE in 2014. I cannot imagine, even with a landslide majority, that our future Labour led council would behave in such a disrepsectful, disinterested, de-voicing and horrificly fascist way.